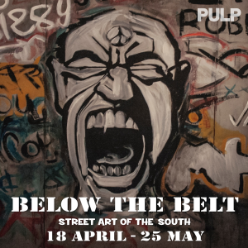 Pulp Gallery proudly presents BELOW THE BELT: Street Art of the South, featuring large scale works ranging from realism to abstraction from some of the South's finest street artists and muralists. Exhibited artists include Chris Veal, SEVEN, Karl Zurfluh, INOPE, and the Lotus Eaters Club. Free open house preview on Thursday 18 April.